Actor Aishwarya Rai Bachchan made heads turn when she walked the Cannes 2012 red carpet, showing off her post delivery curves in an Abu Jani-Sandeep Khosla Indian ensemble. The outfit met with mixed reviews – with most fashion critics harping on the fact that the beige and gold sari only highlighted Ash’s voluptuousness. This time, however, the fashion duo seemed to have the approval of a majority of critics, as they dressed actor Tabu for the Golden Globes 2013. Yes — our darling Tabu dazzled on the red carpet in an equally inflaming red and gold sari. 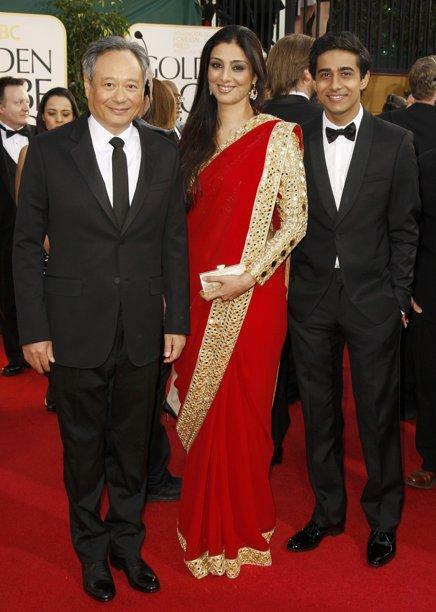 She was accompanied by Life of Pi director Ang Lee and the actor who played her son, Pi, in the movie, Suraj Sharma. Talking about the gorgeous sari, Abu-Sandeep said, “This mirror work jacket is a revival of our vintage work in mirror from 24 years ago. We teemed it with a sari in vermillion, the colour of India. She carried the ensemble and herself to perfection, the way she always does.” Jackpot, we say!